Crescenza Foccacia CheeseReviewed and recommended by Shape Magazine, February 2007! The physical exertion of the cows increased the butterfat content of the milk and the cooler temperatures were necessary for preserving the freshness of the cheese. Today, with digitally controlled temperature and humidity cooling, this cheese can be produced year round. BelGioioso is pleased to produce this delicacy in the United States. 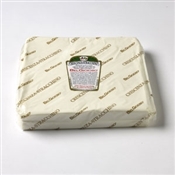 Crescenza-Stracchino is a fresh, rindless cheese made from whole pasteurized cow's milk. The texture is soft and creamy with a uniform consistency and it spreads and melts easily. It has a mild, milky flavor with a hint of tartness that entices you to eat more. May need to allow 7-10 days for shipment as it is not always available at Belgioioso on the day you order. Please call if you have any questions 800-717-9020.